By Matt Walker Editor, BBC Nature. Populations of the world's rarest dog, the Ethiopian wolf, are genetically fragmenting, scientists say. Fewer than 500 of Africa's only wolf species are thought to survive. Now a 12-year study of Ethiopian wolves living in the Ethiopian highlands has found there is little gene flow between the small remaining populations. That places the wolves at greater risk of extinction from disease, or habitat degradation. In a study published in the journal Animal Conservation, Dada Gottelli of the Zoological Society of London and colleagues in Oxford, UK and Berlin, Germany, quantified the genetic diversity, population structure and patterns of gene flow among 72 wild-living Ethiopian wolves. The team sampled wolves living within six of the remaining seven remnant populations, as well as from one population at Mount Choke, that has since become extinct. They found that genetic diversity was relatively high for a species that has declined to fewer than 500 individuals. That may be because discrete populations of wolves survived in Africa after the last glaciation period, which ended 18,000 years ago, and a number of rare gene types became fixed and maintained in these separate groups. However, this isolation is now working against the wolves. Researchers studied gene types at 14 separate locations on the wolf genome. They found that there is now weak gene flow between the Ethiopian wolf groups. That could be because, like other canids such as grey wolves and red foxes, Ethiopian wolves prefer very specific habitats and are unlikely to travel long distances. That makes it unlikely that the wolves will join other groups, which would provide an opportunity to mix their genes. More worryingly, the researchers also found that sub-populations within each population are also isolated. The Ethiopian wolf separated from its wolf-like ancestor 100,000 years ago when it colonised the Ethiopian highlands. Today it is adapted to life above altitudes of 3,000m, where it preys almost exclusively on high-altitude rodents. But only six populations survive, with a further three having become extinct over the past century. Ethiopian wolves are particularly vulnerable to outbreaks of rabies, a fatal disease that has reduced some populations by up to 75% within a few months. Another major threat to their future comes from habitat loss and fragmentation, which may be accelerated by climate change. 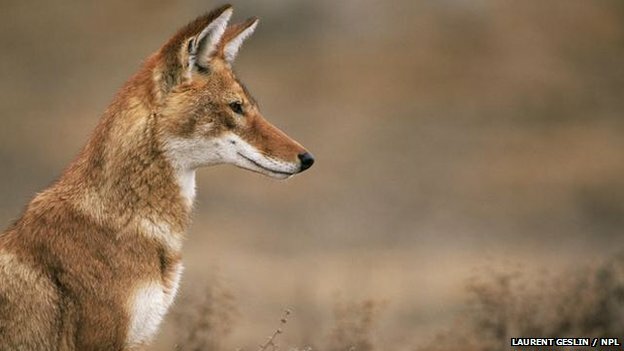 The concern raised by the study is that the limited gene flow between Ethiopian wolves makes them increasingly vulnerable, as they might not have the genetic diversity needed to fight off disease or adapt to new habitats. The limited migration of wolves also increases the risk of inbreeding. The scientists say that efforts must be made to reconnect these isolated populations, by creating habitat corridors linking them. "It may be necessary in the near future to artificially increase population size and restore gene flow between nearby populations," the researchers write. That could mean moving male wolves between populations to trigger fresh breeding. Studies on other species of wolf have showed that moving just one or two males in this way can dramatically increase genetic diversity.